A week ago I looked at my patio and it looked like a barren wasteland. I half expected tumbleweed to blow by. It’s not that we hadn’t brought the furniture out yet and the deck had just been power washed. 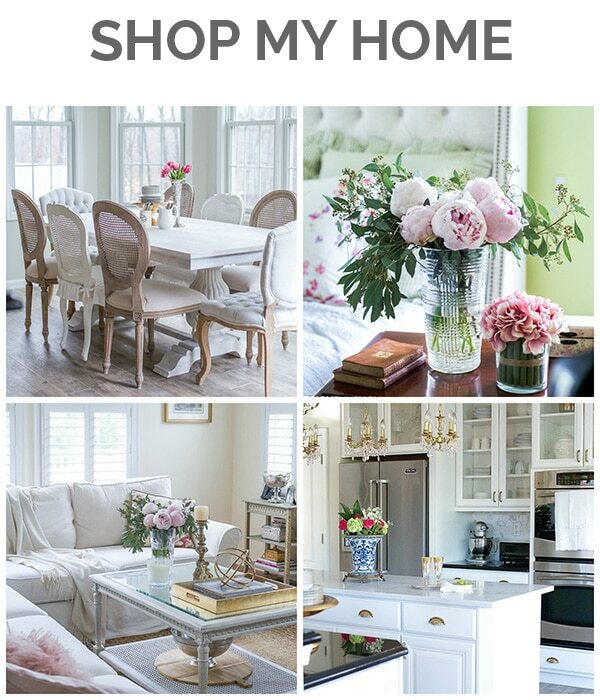 But my ever-so-neutral sectional and tables were looking more like winter than my favorite vibrant-hued season. A re-boot was definitely in order. 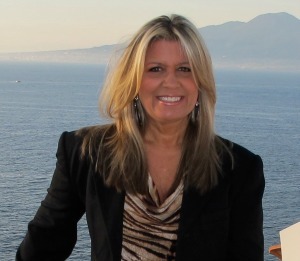 As luck would have it, I had just been contacted by my sponsor, Kirkland’s, and had been invited to shop at their new store opening this week in Paramus, NJ. 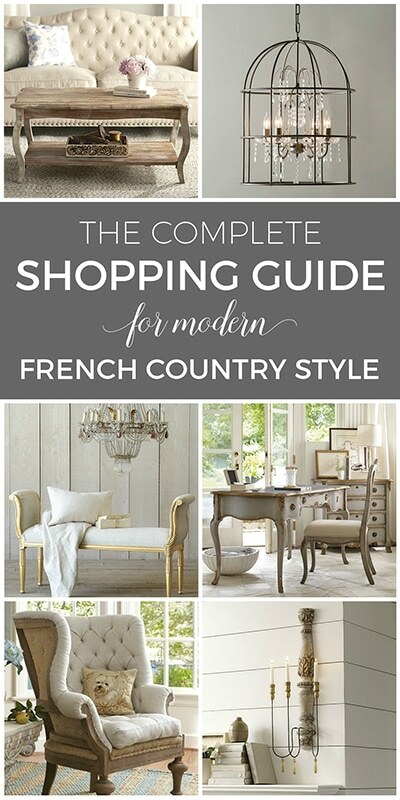 This precipitated a delightful mother-daughter shopping spree that I shared earlier this week in this post. While my daughter focused on her new apartment, I had this patio re-awakening project on my mind. Be sure to enter the gift card raffle at the bottom of this post! Since my goal was to transform my patio without actually buying any furniture and with a budget to adhere to, the plan was to do all the work with accessories and to make the space inviting and pleasant. 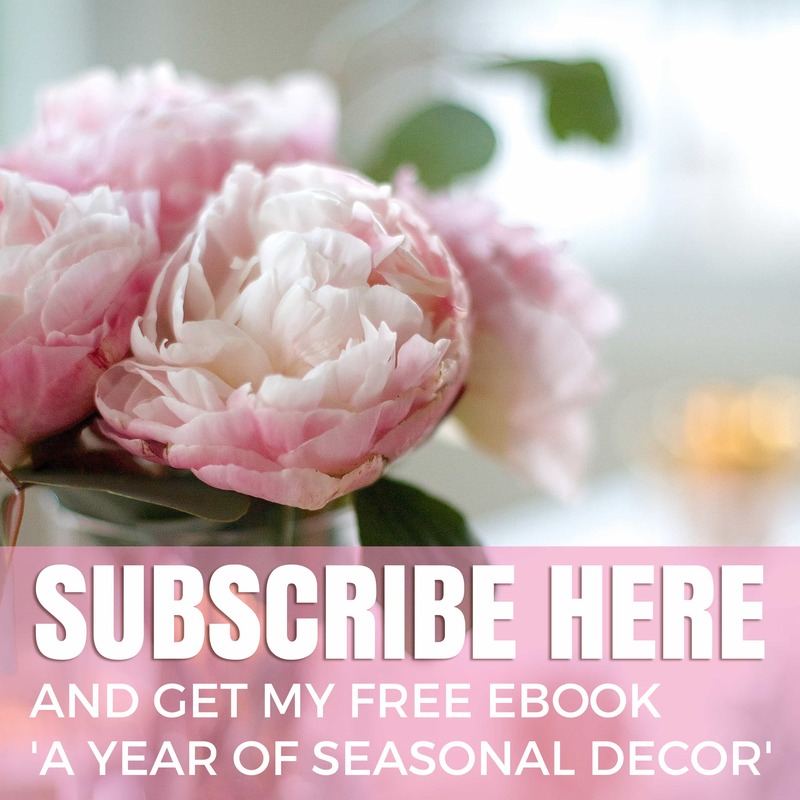 As with all great decorating efforts, the best place to start is with flowers. I found this wonderful pastel yellow pitcher and filled it with a spray of aromatic lilacs. 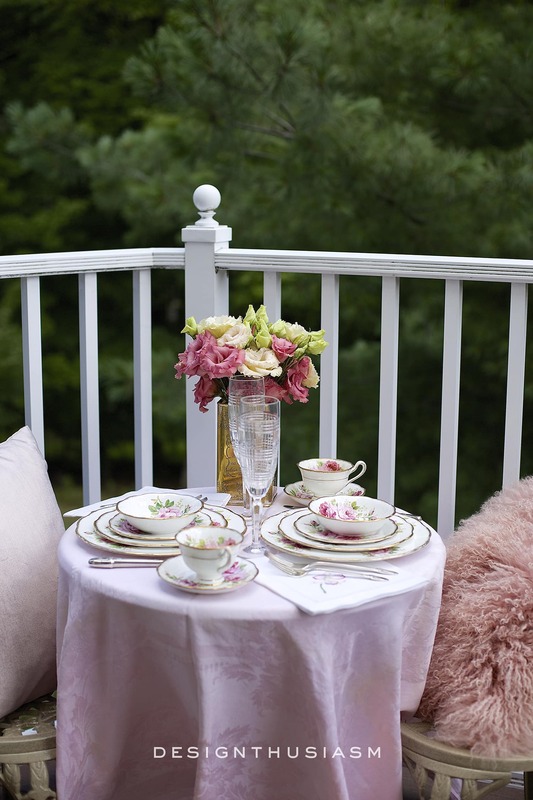 This floral display became my muse, driving the color palette for my patio decor. 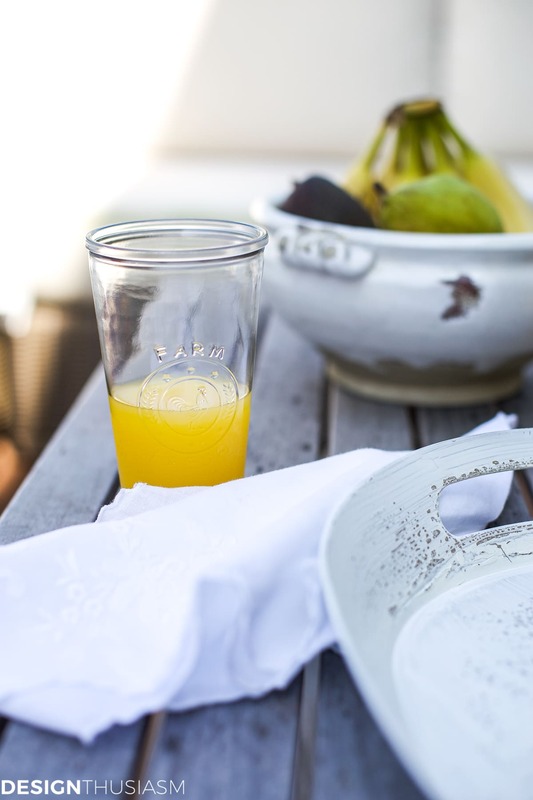 The farmhouse carafe serves farm fresh juice and is part of a charming caddy set with glasses. 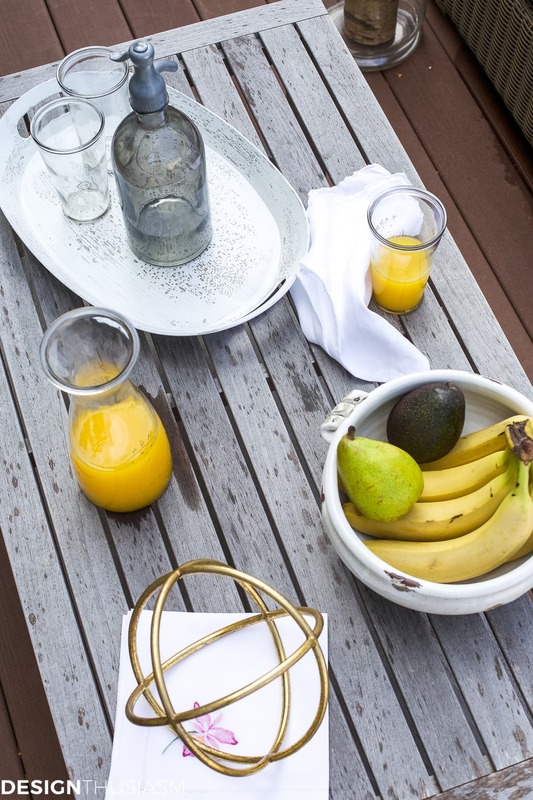 What summer gathering is complete without a bit of fruit? 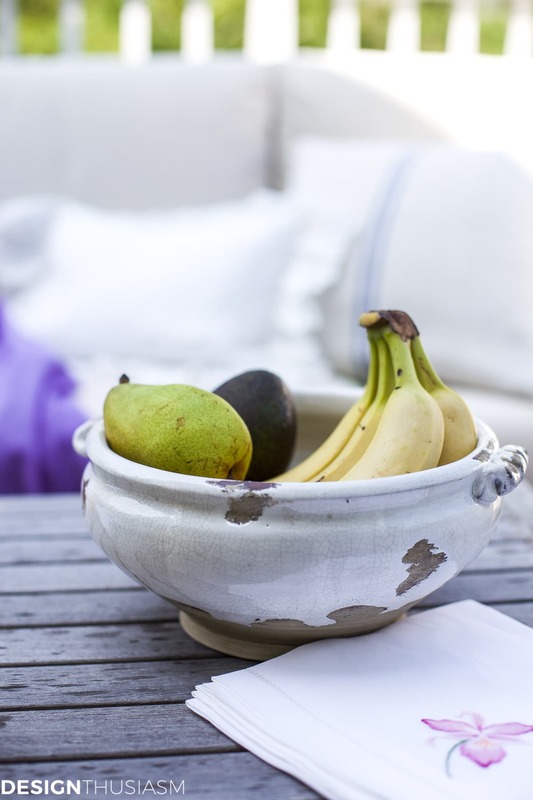 This sweet distressed bowl is perfectly sized for the coffee table and imparts a lovely country vibe. Our rattan sectional with cream cushions makes it easy to update the look with a simple change of outdoor decorative items. 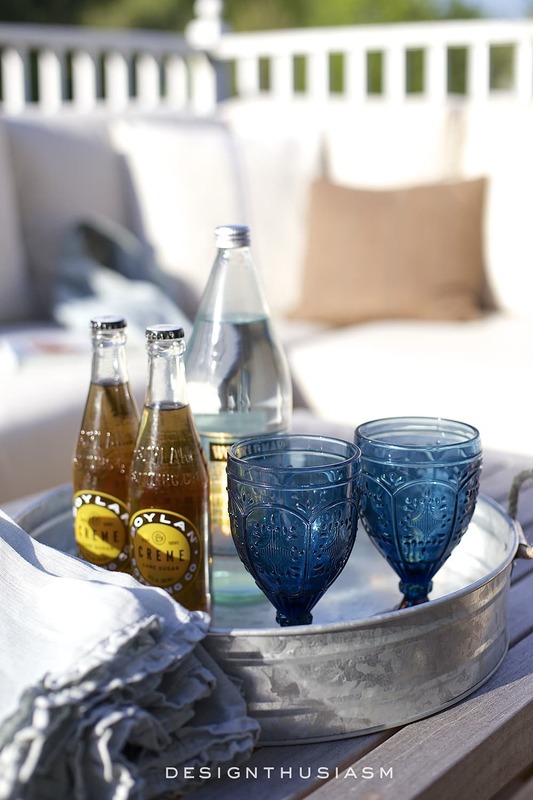 A distressed white serving tray sits at the ready to corral juice glasses and embroidered linen napkins. I love these chunky glass lanterns for preparing candles for when the sun begins to fade. 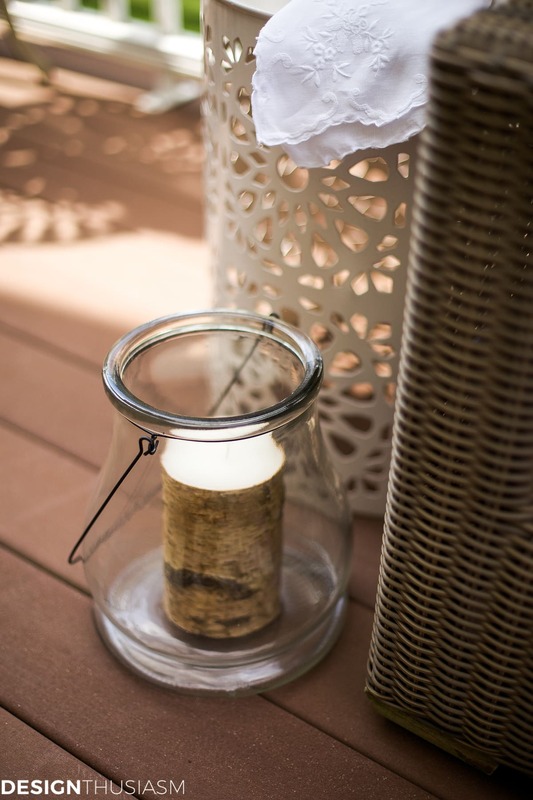 They’re also great for citronella candles to keep bugs and pests away. 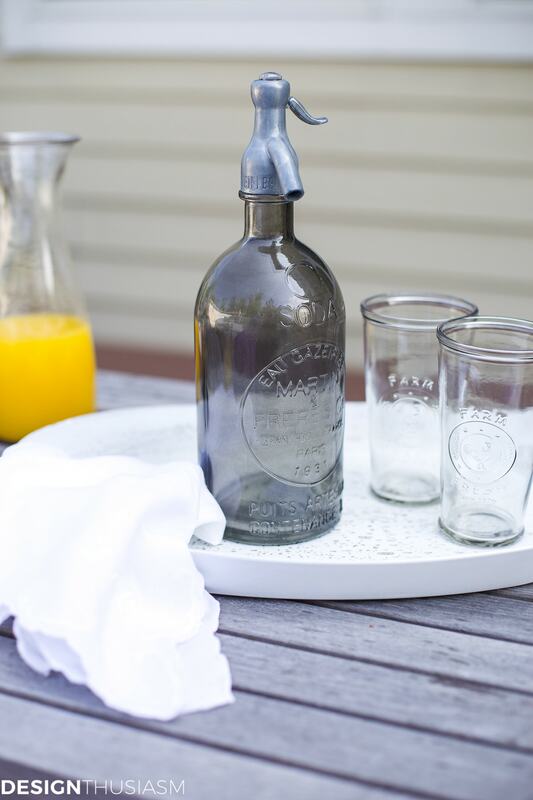 The spritzer bottle is a fun nod to times past, but is also great for serving cold drinks. Anticipating guests’ needs is always appreciated and I included the gold sphere below, to keep napkins from blowing in the breeze. 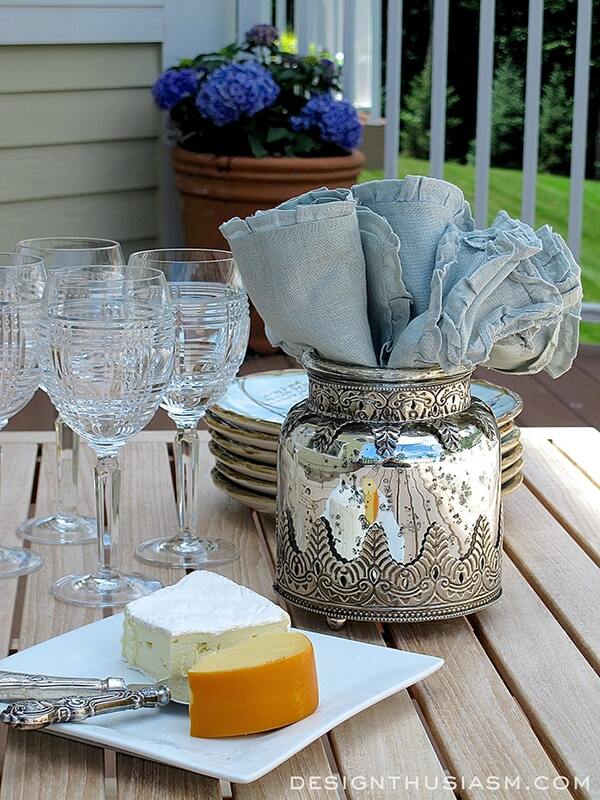 Our patio is a place we love to entertain and having outdoor accessories to fill your needs is both practical as well as pretty. A big thank you goes to Kirkland’s for sponsoring this post but the opinions and summer lovin’ are all my own. If you live in NJ and you’d like to check out the store to see these items in person, be sure to visit for the grand opening in Paramus on Saturday, May 6th. We also have a $50 Kirkland’s gift card giveaway for one lucky reader, so click the link below to enter the raffle for a chance to win. You can enter to win the gift card up until the night of May 11th. Good luck!! 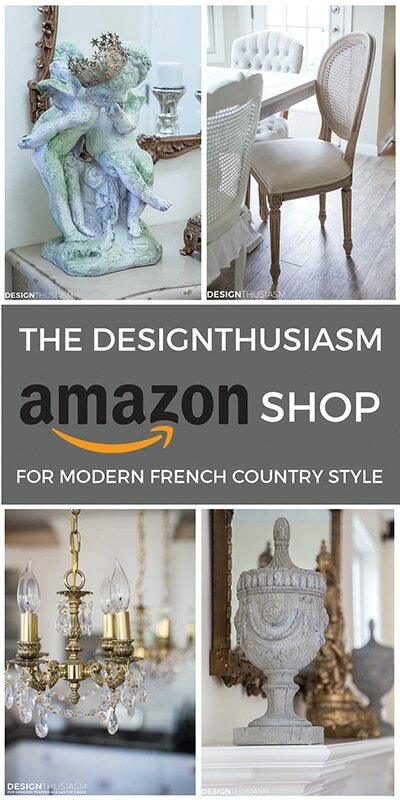 Smart decorating with accessories! Looks beautiful. I’m sorry, but I had to laugh. The distressed bowl’s shape just reminded me of a chamber pot too much! Everything looks beautiful. I love lilacs, my lilac shrub has lots of buds on it, but it’s still too cold here for it to bloom. 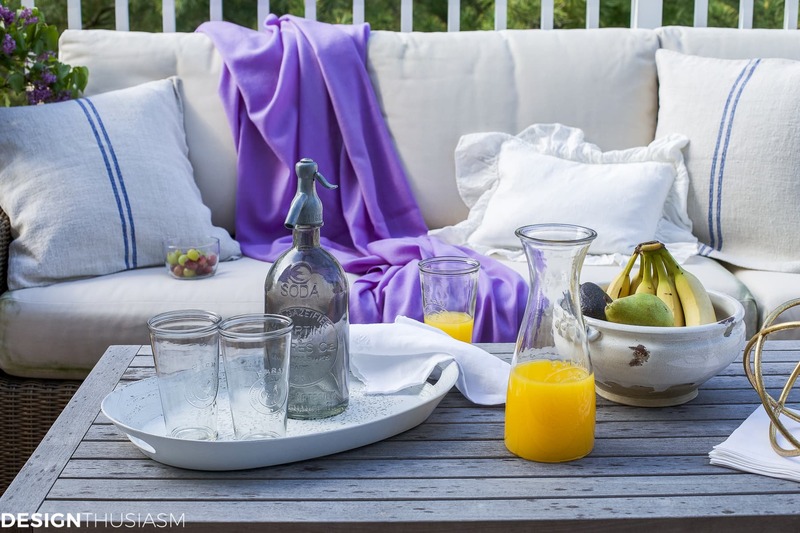 Love the lilacs and all the accessories – looks so inviting! Lory, you have the design eye for sure. 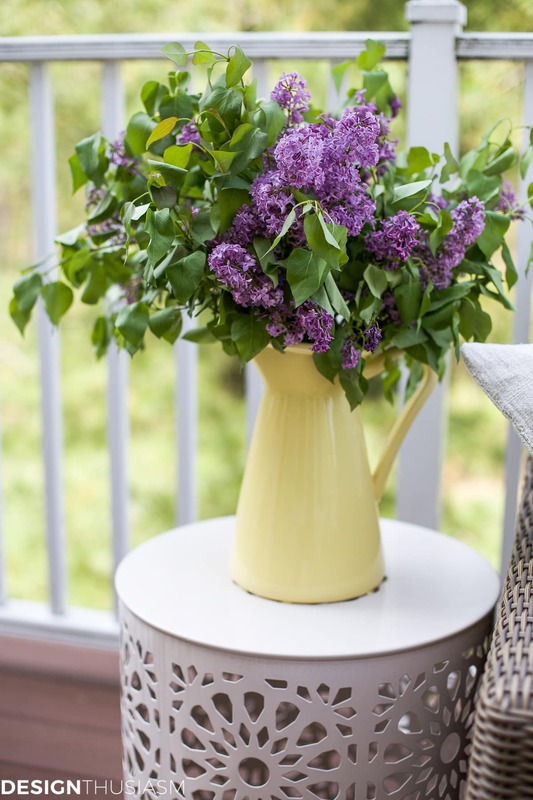 Love your lilacs in the yellow pitcher that influenced your other accent pieces. It’s so nice to have a source list and fun to hear your design mind working. Great patio refresh. Wish I could run out and purchase some lilacs in our area. Thanks, Bonnie! Well, I’m still anxiously awaiting peony season too. Have you got those near you? I love your patio and the sectional furniture you have. Your bright touches really make it come alive. 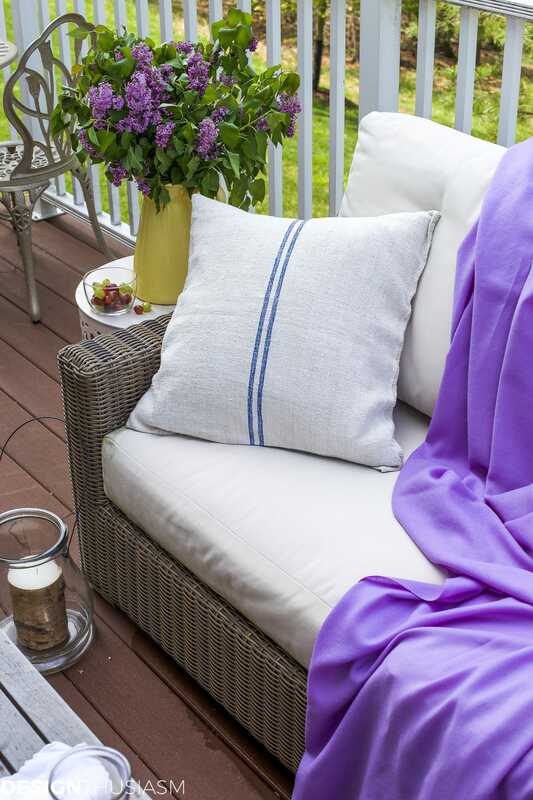 As your deck isn’t covered from what I can tell, how do you protect the cushions from rain ?! I have sunbrella cushions, but am constantly removing them and putting back on. Kirkland’s is a wonderful place to find unique iitems at good prices ! Thanks, Kathy! Yes, my cushions are Sunbrella too. I don’t generally bring them inside, except for in winter, but they do sometimes take a bit longer to dry than I’d like. They’re also beginning to get green stains, likely from tree sap, so I’ve been researching how to remove them. Nothing better than a great porch to relax on! Hey, Lory. 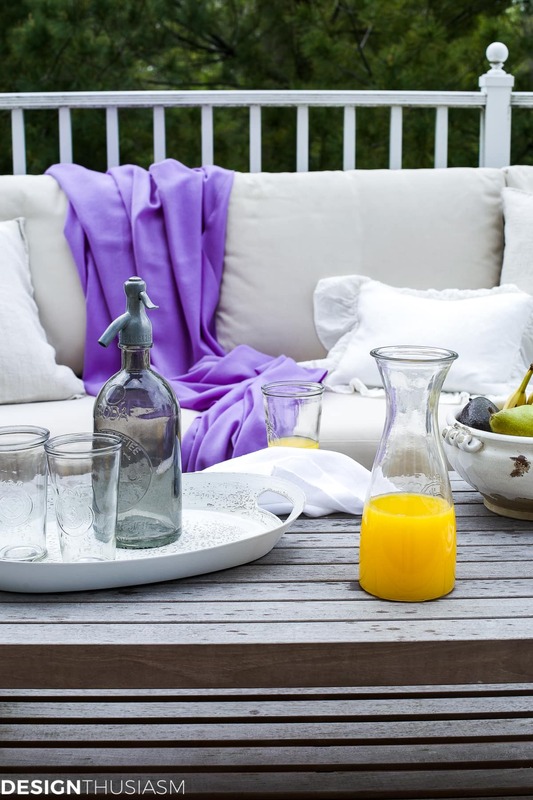 Excellent tips and choice of decors and accessories for the patio. The yellow pitcher and the lilacs are a perfect combo. Printed or patterned designs for the cushions might be a good idea, too. 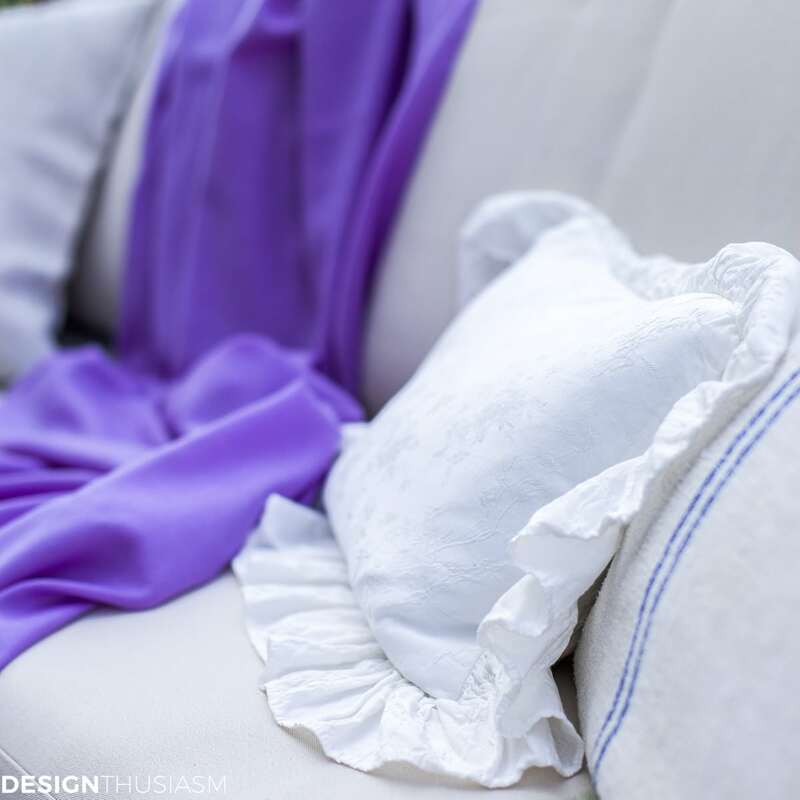 Interesting timing, as I just finished a photo shoot and am currently working on a post for tomorrow utilizing print and patterns on the patio. Stop back tomorrow to take a peek. Adding accessories to change things up is smart can cost friendly. 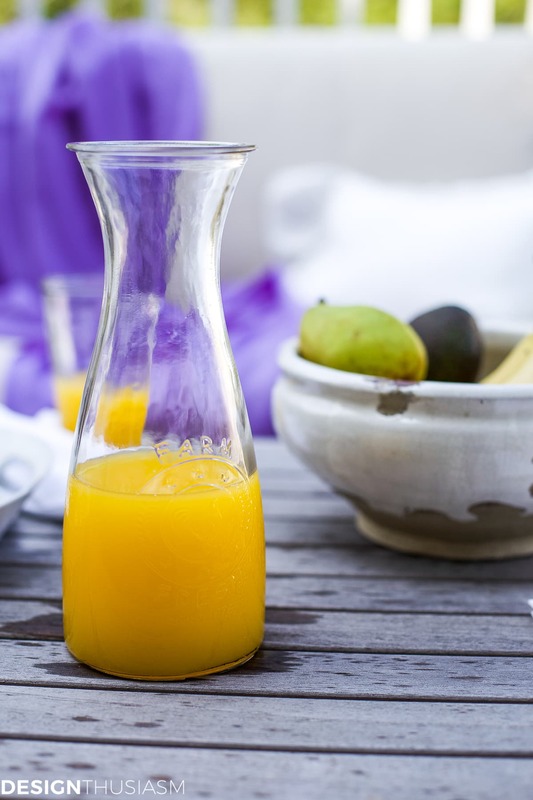 I love the carafe set and I see a visit to the Kirklands store in my near future.